“The Amityville Horror” is a classic horror novel written by the writer Jay Anson, based on the stories of the family of George and Katie Lutz, who claimed that they were victims of paranormal activity in their new home in Amityville, New York. Their story to this day is one of the most scariest stories ever told. It should be noted that although skeptics challenge the authenticity of the book both spouses have passed the test on a lie detector. The book has enjoyed a number of continuations as well that on the other side have been made up. The entire series of “Amityville” has ten film adaptations. The core of it all, however, is the book by Jay Anson. for example definitely left me stunned after reading it. 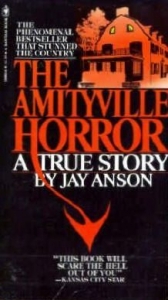 However, no book has managed to disturb me as much as “The Amityville Horror.” The reason for this is likely the hypothesis that it is based on real events that have actually happened. If this is true, we can not really do anything else except to rethink the certainty of our knowledge and the science of the world and pray to never ever witness such monstrous phenomena. If not, and the book is fictional, which I hope it is, I can only congratulate Jay Anson for the way in which he told the entire story - in an almost documentary, relatively dry style and describing unnatural events that gradually rise the tensions to such an extent that it reaches a crescendo. If you want a book that can really frighten you, “The Amityville Horror” is the correct read for that purpose. Some of their books have startled me, and others have definitely increased the level of adrenaline in my blood. I had to agree with you on this. I have seen the movie and read the book. I am fairly familiar with Jay Anson and the author writes great horror and great books with loads of action, story line and suspense.